Large volumes of water ice have probably been detected below Mars' surface, far from the planet's polar ice caps, scientists have said. The Sharad radar experiment, on Nasa's Mars Reconnaissance Orbiter (MRO) spacecraft made the discovery in the planet's mid-latitudes. The ice is found in distinctive geological structures on Mars' surface that are hundreds of metres thick. The radar data suggest that some of these features consist mostly of ice. The latest evidence was presented at the 39th Lunar and Planetary Science Conference here in Houston, Texas. Sharad (SHAllow RADar) is able to probe up to 1km beneath the Martian surface to seek out liquid or surface water. Built and supplied by the Italian Space Agency (ASI), it sends out pulses of radio waves to the Martian surface and analyses the time delay and strength of the waves that return. Analysis of those waves that penetrate the soil and bounce back can give information on transitions between materials with different properties, such as rock and liquid water, beneath the Martian surface. Mission scientists used Sharad to probe Martian surface features known as lobate debris aprons (LDAs). These distinctive, dome-shaped structures are concentrated around mid-latitudes in the planet's northern and southern hemispheres. 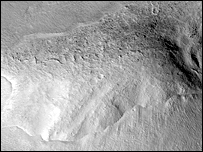 One team of researchers looked at LDAs in the Deuteronilus Mensae region of Mars' northern hemisphere, where the features can be found at the bases of valley walls, craters and scarps of mesas. Another group of scientists studied these features in the eastern Hellas region of Mars' southern hemisphere. Scientists have long suspected that LDAs were flows consisting of mixed up rock and ice. The radar penetrated these geological features with very little attenuation (reduction in signal strength), suggesting they were predominantly made of ice. "We would say, robustly, more than 50% ice by volume - but it could be much more," said Dr Jeff Plaut, who presented the Sharad findings from Mars' northern hemisphere. Dr Jack Holt, from the University of Texas Institute for Geophysics in Austin, discussed the results from the planet's southern hemisphere on behalf of his research team. He told BBC News: "The radar sees through [an LDA] with very little attenuation. The fact that there aren't lots of reflections coming from inside indicates that it's pretty much massive ice. "Maybe there is dust and some small rock content mixed in throughout. But it's not a lot and it's not layered. There's not much structure to it." He added: "There's a pretty significant amount of water locked up in these things." If confirmed, the discoveries could have important implications for the history of water and climate on Mars, because it suggests there were large reservoirs of subsurface ice when the lobate debris aprons formed. Dr Plaut said the LDAs he had studied probably formed in mid- to late Amazonian times - the Amazonian being the cold, dry period of Martian history which began around 1.8 billion years ago and lasts to the present day. "In the mid-latitudes of Mars, there were large volumes of ice that were deforming, at least, during Amazonian times... and maybe they were in place during Amazonian times. And much of this ice is preserved today," explained Dr Plaut, from Nasa's Jet Propulsion Laboratory (JPL) in Pasadena, California. He suggested these thick ice deposits should be targets for future robotic or manned missions to explore. "These are certainly intriguing targets for in situ exploration, conveniently placed at mid-latitudes," the JPL scientist told the conference. The radar data complemented other evidence presented at the conference on the icy nature of these geological features on Mars.